There is speculation that the game may have originated in Ancient Egypt thousands of years ago. However, from the 5th century BC people in China played a game called ti-jian-zi, which can be directly translated as ‘kicking the shuttle’. This version of the game required players to keep a feathered shuttle from hitting the ground without using hands. It was later renamed chien-tssu. It is debatable whether this game was the origins of the present day sport, however, this was the first game which used a shuttlecock. Five centuries later, a game called Battledore and Shuttlecock became a popular not only in China, but also in Japan, India and Greece. In this game, the battledore (or paddle) was used to hit the shuttlecock, back and forth. By the 16th century, this version of the game became widespread amongst children in England and the Far East. In France, the game was known as Jeu de Volant. 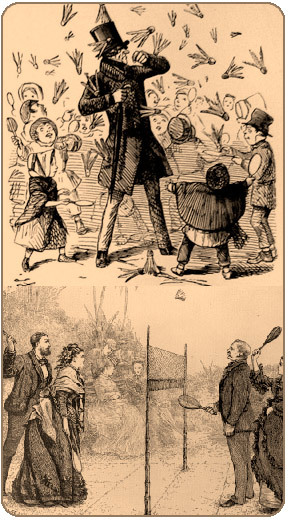 During the 1860’s a similar game called Poona was being played in India, but the game had developed and now had a net and players on opposing sides. British Army Officers who were stationed in Pune (or Poona), India, brought the game back to England. They stayed at Badminton House in Gloucestershire, England as guests at the Lawn party, held by the Duke of Beaufort. Although, this estate is now better known for horse trials and hunting, it is credited as the formal birthplace of badminton and where the modern game derived its name. Within Europe, badminton was viewed as an Upper class pastime and its popularity spread. The first set of rules being written by the Bath Badminton Club in 1877. Standardised rules were devised in 1887. Despite rules being written, the British regarded the sport as amateur, whereas, their Asian counterparts took the sport more seriously, developing professional players in China, Korea, Malaysia, Indonesia, etc. These countries still dominate at badminton as a competitive sport. Short documentary film about the roots of Badminton. The Badminton Association of England (BAofE) was formed in 1893. The International Badminton Federation (IBF), now the Badminton World Federation (BWF) was established in the former half of the 20th century. However, it was not until 1992, that badminton gained Olympic status. Nauright, J. Parrish, C. (2012). Sports Around the World: History, Culture and Practice. ABC-Clio. United States. Roots of Sport Table Tennis project commemorates the life of legendary Desmond Douglas and his seminal contribution to Sport generally, but particularly table tennis. The project consists of both educational and practical focus on the game’s history, the impact Desmond Douglas made on it, primarily the way in which he defeated racist challenges, developed the game and made it truly accessible to diverse communities. During the 1970’s & 1980’s, Desmond Douglas won a total number of 11 titles, was No.1 in Europe and England and ranked No.7 in the world, at a time when the sport was dominated by the Chinese. In 2001, he was ranked 8th in England. Desmond Douglas was the most successful post-war British Table Tennis Champion. His legacy to table tennis is respected by sport elites worldwide. Desmond Douglas has achieved legendary status. The ‘Roots of Sports Table Tennis project aims is to reach young people and adults from diverse backgrounds, who wish to learn about the sport and celebrate its rich cultural heritage. This will be achieved through a series of exhibitions and workshops:- Seminars/discussions on ‘sport leadership’ and the impact it can have on lives; Educational resources such as USB memory sticks and interactive media pack; Wall of Fame Exhibition of Table Tennis historical contributors; Exhibition of the history and development of Table Tennis equipment; i.e. ball, bat, rubber sheets, Art and technology in Table Tennis; Presentations in schools, local community centres and youth clubs; Coaching and training workshops on the physical game; Development of a training manual for practical and educational use; Competitions and tournaments within a community cultural framework; Short documentary film about this Roots of Sports Table Tennis project; and the development of a rhythmic element of the sport. Roots of Sport commemorates the life and achievements of Joe White, who was born and raised in Hackney by Montserratian parents. He set up White Heat Basketball Club in 1999, to give gifted junior basketball players the opportunity to play the sport at senior men’s level, where international players are more favoured. White Heat enabled Joe to send players overseas, mainly the USA and to produce and develop British-based talent. These talented players would not only play at the highest level in England, but also overseas, thereby raising the standard of British basketball on a whole. Joe popularized Basketball in East London by putting the ethos of the game to good use at grassroots level in Hackney, which helped to keep some Black youngsters out of trouble. He founded White Heat Basketball Club. Joe White’s activities became legendary and he is canonized by those who have benefitted from his life-saving work. Unfortunately, Joe died in 2002, at the age of 40. Educational resources such as USB memory sticks and DVDs.